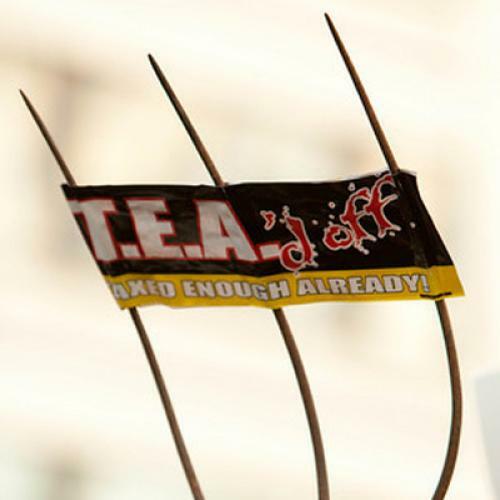 The Tea Party’s frustrated moderates. So I couldn’t help but watch Skoda as he sat in a huge ballroom on the convention’s second night, listening to Joseph Farah, the mustachioed editor of the far-right-wing website WorldNetDaily, work the crowd of 600 into a frenzy. “If Barack Obama even seeks reelection as president in 2012, he won’t be able to go to any city, any hamlet in America without seeing signs that ask, ‘Where’s the birth certificate?’” Farah crowed from the podium. The assembled conservatives guffawed and cheered through Farah’s 40-minute-long diatribe--which went on to describe Obama’s plot to destroy the free-enterprise system and build a socialist state in its stead--but Skoda just stared blankly ahead, looking down occasionally to fiddle with his iPhone. He couldn’t have been pleased. Skoda and convention mastermind Judson Phillips have ambitious goals for the Tea Party movement. They aim to build their respective groups (Skoda is founding a Tea Party PAC; Phillips heads an organization called Tea Party Nation) into political players that can influence votes and tug candidates in their direction. But their quandary is as plain as the expression on Skoda’s face during Farah’s paranoid Friday night monologue: How can a movement whose base detests mainstream politics--not to mention, has a few screws loose--possibly build political clout? Skoda, who, at the convention, wore a black turtleneck under a sport coat, doesn’t fit the Tea Party stereotype. An information-systems executive for multinational corporations, he has lived all over the world, picked up multiple languages (I watched him charm a correspondent from Japan by chatting in Japanese), and learned his way around a press release thanks to years of orchestrating mergers and acquisitions. Like most tea partiers, Skoda--who hosts a Tea Party-themed radio show in Memphis three times a week--tells the familiar story of being woken up by CNBC host Rick Santelli’s on-air rant against mortgage bailouts last February. He took charge of the Memphis Tea Party shortly thereafter, spoke at rallies during the spring and summer, and brought a busload of protesters to Washington last September. When the planned national convention was reeling from negative press coverage in early January, Skoda called up Phillips--a Nashville criminal-defense attorney who was organizing the glitzy affair--to ask if he could help. Skoda rationalizes some of the Tea Party’s rough edges as a necessity of movement-building. “I think it’s always useful to get people excited,” he says. “Part of this movement is visceral. It’s perfectly okay.” But he is much more interested in practical politics than in bombast. Between speeches, he led a session on using Internet tools to run campaigns on the cheap. (“This is just what I need,” said a man thinking about running for Congress in Ohio.) Meanwhile, Skoda’s new PAC will funnel Tea Party money into campaigns that he thinks conservative Republicans can win. Skoda and Phillips’s philosophy is contributing to something of a schism within their movement. Integral to the Tea Party ethos is a kind of anti-politics: Both parties in Congress have gone bankrupt, tea partiers say, and, for some, “Republican” is an even dirtier word than “Democrat.” But the pragmatists believe that, at least for the moment, getting what they want is going to require working within the two-party system. “The reality of life is, I’d be shocked if we elected any independents this year,” says Phillips. “So it’s gonna be Republicans to get a conservative majority." Political realism, however, isn’t what the Tea Party base wants to hear. Skoda alienated much of his Memphis group by unilaterally opting to endorse and fund local candidates. And several Tea Party activists grumbled about Phillips’s decision to invite politicians to speak at the convention. “They need to hear from us, not us hearing from them,” says one dissident who had previously left Phillips’s organization. Add to this a number of other internal disagreements--for instance, Phillips pushed out several volunteers when they protested Tea Party Nation’s for-profit status--and the Tea Party movement has sometimes seemed to be on the verge of devouring itself. On the last day of the convention, Herr and three other Tea Party Nation defectors showed up at the Opryland Hotel to hold a press conference. In the preceding weeks, they had united 34 of the state’s Tea Party groups into the Tennessee Tea Party Coalition and wanted the media to know that they were the real grassroots endeavor. Though they declined to level outright attacks against the tea partiers participating in the convention (“We don’t want to be drug into a contest with them,” one explained), they did complain about the event’s exclusivity and suggest that Phillips is excessively sympathetic to the GOP. Whether the tea partiers will prove too busy fighting among themselves to fight the Republicans, the Democrats, and the system writ large is anyone’s guess. But Skoda is pragmatic enough to know that he can’t cut the non-pragmatists out of the coalition altogether. And so, his vision of winning elections remains in an awkward marriage of convenience with the likes of Farah, and anyone else who doubts Obama’s citizenship. “Look, Joseph Farah--when you look at the statistics and the polling, there are some people who believe this is problematic,” he told me, referring to the birth certificate. “Do I agree with all of his premises? I don’t have to. That’s America."